Fans of "Two and a Half Men" may have noticed that star Ashton Kutcher looks a lot less scruffy these days. Was the haircut a kind of post-Demi catharsis? Nope! Kutcher trimmed his locks for his "Two and a Half Men" character, Walden Schmidt. Ashton spoke about his new look at a PaleyFest panel in Los Angeles on Monday. 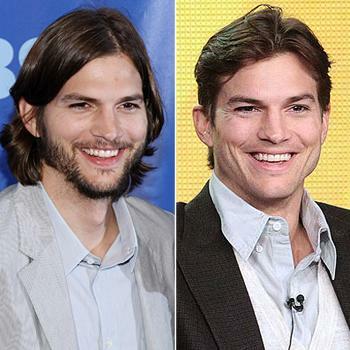 At first, Kutcher joked that he cut his hair and shaved because "Jesus wanted (his look) back, so I gave it to him." But seriously, folks, it was all about his character's relationship with Zoey (played by Sophie Winkleman) on the CBS sitcom. Show creator Chuck Lorre explained, "We wanted to tell a story about being in a relationship and being pressured to change... Walden pushed back and said, 'You can't change me. This is who I am.' But once she stopped trying, he got a haircut and changed." Men. They really aren't that complicated. Ashton claims he misses his shaggy look, saying that he enjoyed "looking homeless." According to The Wrap, CBS is still negotiating the return of "Two and a Half Men."